@TheMimsy, Yes, that's the under-2s site. The over twos go further up Crouch Hill in New Orleans Walk. I know, I know. I must be less judgmental. Ae housman! What! still alive at 22/ A fine upstanding boy like you. That, Krappy, would be a good idea. I have been quiet lately. Two small children, and am to my own surprise writing fiction - or at least trying to. It's almost like there's been funding cuts or something. I'm making a hobby of picking up litter. Arkady, The planning permission for that one to go went through well over a year ago. Yes, the app is great. The bulky waste collection thing is understandable given cuts, but it might be counterproductive if leads to more fly tipping. Google swimmingroundlondon - excellent blog. It's nice round here. Not quite as fancy as Crouch End (though we have a theatre and they don't), but I've never felt remotely threatened. Think it must be. I wish they'd take down the food photographs they've got up - I worry they might be putting people off. 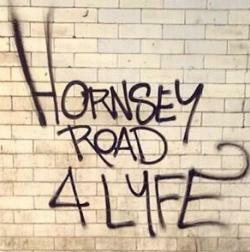 Try having a chat to Clever Mike on Hornsey Road - there might be space around there. It does feel like a protest vote gone horribly wrong.